Why register with Google Street View panotour? your location before they arrive. For detail explanation, click here. How much does the panotour service costs? It depends on how many photospheres all together are needed in the tour. in the total cost. (The minimum no. of photosphere is 3). Where exactly will the panotour appears? Google My Business and of course, Google Search. all around. Panotour is make up of linking different photospheres together into a route. Does Google charge any fee for doing this? Is “360power.ca” affiliated with Google? No. 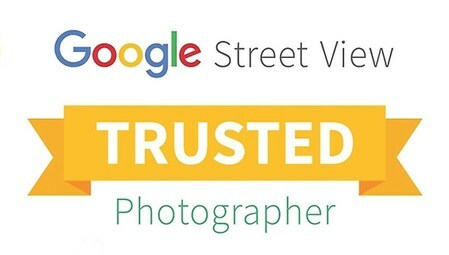 We earned the Street View Trusted Photographer Badge from Google. What is Trusted Photographer Badge? our clients’ SEO ranking might also receive a boost upwards in local searches. (You can verify the Trusted Photographer List here). Can business owners upload their own photospheres/panotour? How long it takes for the photospheres/panotour to appear after uploading? According to Google, images typically appear on Google Map within seconds. the agreement, warranty, and future ownership rights. Can business owner asks for a re-edit of the images after uploading? we do not encourage re-edit. But we’ll try to be as flexible as possible depending on the situation. Do you provide other kind of 360 production services? Yes, we do. Please let us know how can we help and we’ll get back to you asap.